Salzburg is a somewhat rainy place. Churches and other religious attractions offer an often welcome indoor alternative to sightseeing in the rain. As the capital of one of the World's oldest Archbishoprics, Salzburg is home to dozens of churches. 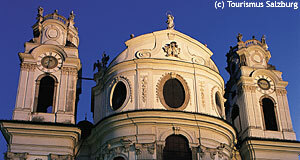 This directory is a list of the more noteworthy churches in the city of Salzburg. It should provide an overview to international visitors. If we have missed out on any important ones, let us know and we will include them.